A magnificent Albert Bierstadt oil painting (5 feet high by 8 feet wide) of Mount Rainier dated 1890-1891 that was in my gallery has been sold at the Coeur d'Alene Art Auction house in Reno, Nevada for their 2011 sale held on July 23rd at the Silver Legacy Resort in Reno. It is owned by Richard Bressler, former CEO and Chairman of the Burlington Northern Railroad, Burlington Resources, El Paso Natural Gas and Plum Creek Timber. The estimate is $1,500,000-2,500,000. It sold for $1,900,000 plus commisson of 17% for the first $500,000 and 12% for the balance generating a total sale of $2,189,000. Oil on canvas; framed dimensions: 65" x 94 3/4"
Impressive in scale yet lavish in detail, Albert Bierstadt's great paintings of the American West depict both the poetry and the majesty of the wilderness. Bierstadt was among the most successful nineteenth-century artists who worked to capture America's hopes for future greatness in the untamed expanses of the West. He created images of grandeur which could not help but add to America's love of the mythic West and the spirit of adventure and discovery that it represented. While his works contained accurate information of the flora and fauna, and detailed renderings of actual locations, Bierstadt's scenes primarily display a captivating sense of wonder. The beauty of Bierstadt's works arises not only from the clarity and skill of his painting, but from his ability to embody the American notion of Manifest Destiny, a belief that divine will coincided with national interest in the American push to the Pacific. Mount Rainier was the product of Bierstadt's journeys to the region in July of 1880, the early fall of of 1881 and October 1889. As he travelled the artist made drawings and oil sketches on paper from which he painted this enormous canvas on his return to the studio. 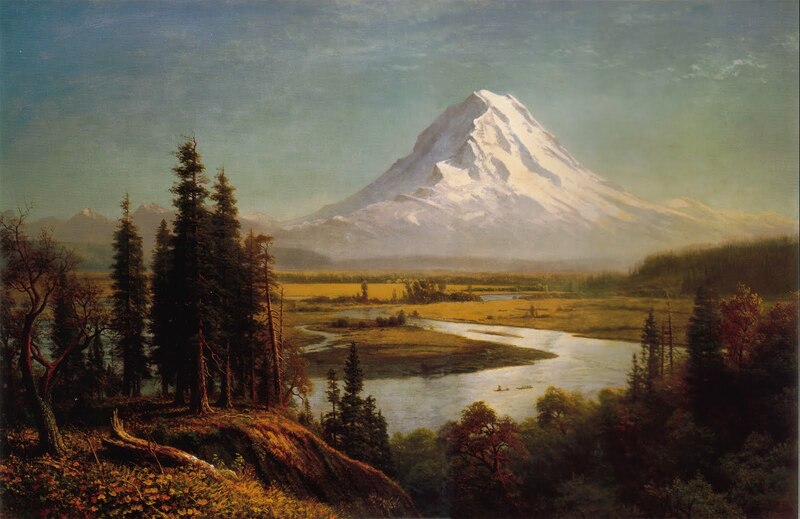 It was the fourth of his monumental canvases of the Pacific Northwest following Mount Hood (1865), Puget Sound, on the Pacific Coast (1870), and Mount Adams, Washington (1875). In this work he dramatized the sheer majesty of the 14,410 foot volcanic peak in Washington's Cascade Range in a view looking southeast across the Puyallup River. The painting was intended as a window onto the actual landscape, thus, adhering to the philosophy of the Hudson River School of the 1850s and 1860s. The colossal mountain is framed by the trees in the foreground and the river draws the eye to the mountain as it snakes through the expansive flood plain. The two canoes traveling along its length appear in harmony with the magnificent natural setting, although it is implied that the arrival of the white man will change all of this. Upon its completion, Albert Bierstadt wrote to the great railroad financier James J. Hill, inviting him to his studio to view the painting. Bierstadt noted that Mount Rainier was "one of the grandest of mountains" and one located "on the line of your road." It is certain that both the artist and his family held the picture in high regard. The flourished signature - using Bierstadt’s full name (instead of an initial) as well as his surname - on the lower left of the canvas is one sign of that esteem. Another is the implicit mood of the scene, in which lofty grandeur, halcyon serenity and earthly primitivism are combined. Lastly, Mount Rainier intermittently kept company for almost two decades with Bierstadt’s premier late work, The Last of the Buffalo, 1888-89 (at the Corcoran Gallery of Art, Washington, D.C.) It was clear that this work was viewed by the family as a profoundly important masterpiece. We are pleased to offer this important and outstanding example of Albert Bierstadt’s monumental works in oil. It’s provenance is outstanding and has been exhibited in such illustrious institutions as The Metropolitan Museum of Art, New York, and Whitney Museum of American Art, New York. Provenance: Edward Bierstadt, brother of the artist, until 1906; estate of Edward Bierstadt, 1906-1908; American Art Galleries, New York, January 22-23, 1908 sale "Art property and important works in oil belonging to the estate of the late Edward Bierstadt," as Mount Tacoma; Mrs. Albert Bierstadt, by 1913; Gift to the Union League Club, New York, 1913-1995; Property of a West coast collector, 1995-2002. Exhibitions: Berlin, Verein Berliner Kunstler, 1891, Internationale Kunst-Aussterllung as Mount Tacoma; London, Hanover Gallery, 1891, Winter Exhibition; New York, The Metropolitan Museum of Art, 1939, "Life in America: A Special Loan Exhibition of Paintings held during the Period of the New York World's Fair," as Mount Shasta; Baltimore, The Baltimore Museum of Art, 1940, "Romanticism in America," as Mount Shasta; Newark, The Newark Museum, 1954, "Our Western Frontiers," as Mount Shasta; Santa Barbara, Santa Barbara Museum of Art, 1970, " Albert Bierstadt, 1830-1902: Retrospective Exhibition, as Mount Shasta; Bloomington, Indiana University Art Museum, 1970, "The American Scene, 1820-1900"; Fort Worth, Amon Carter Museum; Washington D.C., Corcoran Gallery of Art; New Bedford, The Whaling Museum; New York, Whitney Museum of American Art; Philadelphia, Pennsylvania Academy of the Fine Arts, 1972-1973 "Albert Bierstadt"; New York, the Chapellier Galleries, 1974, "American Art Selection IV"